Sorry, no dining room seating between 4-5pm daily as we prepare for dinner service. Join us for contemporary country meals at the most welcoming and comfortable venue on the Central Coast. 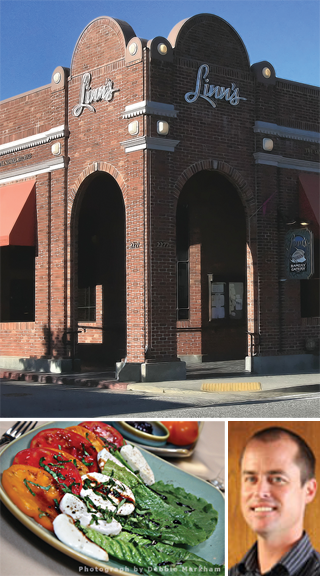 What began as simple fare based on fresh fruits and vegetables from our Santa Rosa Creek and our neighbours' farms in 1989 has grown some over the years, but Linn's Restaurant in Cambria still retains it's country roots with contemporary American recipes, unsurpassed hospitality, and value. Linn's Restaurant is proud to now serve locally raised Hearst Ranch beef on its extensive menu of comfort food classics. Traditional favorites like Linn's pot pies, fresh handmade soups, and Olallieberry pie have won the hearts of many people, visitors and locals alike. These and many other farm classics will always have a place at Linn's, but Chef Matt Beckett has added his own touch of high cuisine to the dinner menu and nightly specials. So, whatever you're in the mood to eat, comfort foods to gourmet, it's a good bet you'll find a satisfying meal at Linn's. Linn's offers an unsurpassed wine menu featuring local Central Coast wines and has the distinction of being the only restaurant in Cambria able to retail wine in its giftshop, as well as, serve wine with your meal. Stay in touch with us on at facebook.com/linnsfruitbin for more details on all our holiday dinners and events and our special discount offers for guests of Linn's Restaurant. Looking for a great place to hold your special occasion group dinner? Contact Aaron Linn for more information e-mail mail@linnsfruitbin.com or call: 1-805-927-0371. Click here to learn more about Linn's Catering or to contact our catering specialist Renee Linn at: renee@linnsfruitbin.com to make your plans today! Linn's executive chef Matt Beckett offers over twenty years of culinary experience in the San Luis Obispo area. Click here to get acquainted with Chef Beckett.